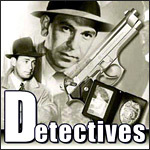 Frank Lovejoy is heard as Randy "Lucky" Stone, a hardboiled reporter who covers the "nightbeat" for the Chicago Star. Randy Stone wandered the back alleys and bars of Chicago, searching for both crime and human-interest stories. Nightbeat premiered on February 6, 1950 and ran until September 25, 1952. Showgirl is a Pickpocket or is She?